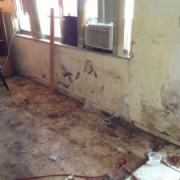 You are here: Home / Restoration USA Tips / What Does The Water Damage Restoration Process Entail? Water damage restoration is a big necessity in Florida. Often times, damages are done due to poor build quality, lack of maintenance, and mother nature herself. When problems do occur in the home, it is great to know what the process will be to restore your property back to it’s former glory. Many companies follow the same baselines, but here at Restoration USA, we strive to expedite the process and get the job done as quickly and efficiently as possible. When it comes to thinking about the water damage restoration process, the first thing you need to know is where the damage comes from. Briefly stated before, there are quite a few mechanisms for water damage. The first we can take a look at is leaky pipes. Old and rickety pipes tend to burst or spring leaks. This causes water to accumulate in the home whether it be behind walls or all over the floor. When this happens, it is best to find out what pipe is broken and pinpoint its location. To do this, we use infrared and circuit cameras to find the leak and determine the condition inside the pipes. For more on this process, check out our leak detection page and read into it for your town. Another main cause is flooding. Mother nature’s wrath truly ravages homes when it comes to flooding. When there is torrential downpour or sea levels rising, your home may not be safe from water. Not only can your beloved personal belongings be at risk, but the structural integrity of your home can also be compromised. Flooding from freshwater or saltwater is not good. Specifically, saltwater is more dangerous. It works much quicker than freshwater and can cause your foundation to crack, metals to rust out, and building materials can crumble. Though saltwater is a fast catalyst, freshwater does just as much damage even if it takes longer. Getting water out is a must. A more minor aspect of water damage comes from holes in roofs, walls, and other faulty building characteristics. Small amounts of water get in and commonly call for buckets in the middle of the room, or it just gets trapped behind the walls. When water gets trapped behind the walls, electrical systems are in jeopardy. Breakers can be tripped and outlets can become defunct. Small amounts of water also can lead to mold growth. Since mold only needs a small bit of water to survive, just the humidity of our tropical weather can be a cause for it. The mold can easily spread and become another issue. It poses health risks and can affect people differently but it is not a threat you want to run into. Some signs of mold are musky earthy smells, and streaks or blotches of discoloration on the walls. At this point, mold is a bigger problem than you think. Mold remediation is an important part of keeping your home safe and it is necessary for your health. Unfortunately, Water can make it’s way into the home. When it does, removing it as soon as possible it critical to your home’s well being. Water spreads quickly through osmosis and the longer it stays, the more susceptible your home will be to mold infestation. The first call may be the most important step. In this call, it is important to have some information ready to go. What will commonly be asked is the full name of the property owner, the address where it is located, insurance information, and what is perceived to be the problem or where it started from. This information will give Restoration USA an idea about the following job and what will entail. Working at your convenience is our goal and we work directly with insurance companies to keep you unbothered with being a middleman. We can schedule a time that fits into your schedule. To start off, Restoration USA will come into the home to the home and gauge the problem. Before any water is removed, we will test the air, take some readings and find out where the problem stems from. Taking into account any future repairs and the possibility of mold, we will give an estimate on the cost to get this task taken care of. Once this is done, we can kick off the removal process. When it comes to minor spills and puddles, it’s easy to clean it up with a mop or towel, but when bigger areas of the home are affected, it is best to leave the rest to the professionals. Restoration USA uses IICRC approved equipment to remove thousands of gallons in a matter of hours. After the initial clean up, it is time to dehumidify the home. We use industrial-strength dehumidifiers to restore the air quality fast. Hard floors, carpets, and walls are subject to further damage if not dehumidified; this structural damage can present very dangerous threats. To avoid the swelling and warping of your property, these areas need to be dried thoroughly. This also prevents deterioration and mold growth. After the home is meticulously dried, odors can be left behind. Dirt, dust and debris can stick back after water evaporates and this calls for sanitization. To take care of this, Restoration USA uses industrial air scrubbers to tackle even the smallest particles that are hiding in all of the nooks your home may have. These high-grade air scrubbers can get into air vents and other crevices that may not be reached by hand. After the remnants of water is taken out, some additional repairs may need to be carried out. Restoring your home is important and Restoration USA will do everything we need to get your home back in tip top shape. Removing banned or faulty building materials such as asbestos insulation and lead based paints may be a responsibility worth undertaking. If this process is carried out, we will restore any areas taken out and finish this process once and for all. Restoration USA has over 25 years of experience dealing with combating water damage, mold remediation, and leak detection. When it comes to these projects, we know what needs to be done to get your home rockin’ n rollin’ once again. We know that problems left under the rug will only worsen with time, so we recommend getting this taken care of ASAP; instead of draining your wallet with constant home repairs time and time again. These disasters don’t let up and find a way to become a nightmare for you and your family. They tend to happen at the worst of times and because of this, we offer 24 hour service and take emergency calls at any hour. For inquiries, give us a call at (866)-745-6428 or fill out our contact form on the Restoration USA website to receive your free inspection. http://restorationusa.com/wp-content/uploads/2017/08/blog-process-entail.png 340 720 admin http://restorationusa.com/wp-content/uploads/2019/04/Logo2-1.png admin2017-08-25 13:43:492019-03-18 14:03:20What Does The Water Damage Restoration Process Entail? Back To School Mold: The Potential Dangers of Children Being Exposed To Mol... Restoration USA Tips: What Goes Into A Mold Inspection?